You know Tummy Time can help, but did you know it can make a difference in only a few days? Watch our video to see before and after footage of the incredible difference Tummy Time can have on a child in just 5 days! The video shows the real life story of a mother who noticed her daughter was missing milestones she found on Pathways.org. After seeing a physical therapist, this mom decided, with help from Pathways.org, to put her baby through Baby Bootcamp, a weekend of using fun activities and engaging toys to get baby to practice rolling over, pushing up, and more. While it may sound like a tough daunting weekend, mom found ways to get the whole family involved. By making Tummy Time family affair, her child was more eager to participate. Watch mom talk about the differences she noticed her third child and what she did to address her concerns. She knew her daughter was not reaching developmental milestones. When she realized this, she turned to Pathways.org to take advantage of all the parent-friendly, educational materials. With help from Pathways.org resources she was able to make a vast improvement in her daughter’s motor development and skills, including major advancements during Tummy Time and Play. Utilizing all of the materials that Pathways.org has to offer, this mom was able to get her daughter back on track for developmental success. Pathways.org empowers parents and health professionals with FREE tools to maximize all children’s motor, sensory, and communication development. With the help of health professionals and the American Academy of Pediatrics, Pathways.org is able to impact parents all around the world every day. 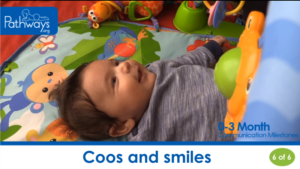 Watch our baby milestone series for video showing what milestones sohuld look like. Does your baby hate Tummy Time? These tips may help make Tummy Time easier. Are you finding our material useful? Help support us, so we are able to reach even more parents.